Now you are living a wonderful life of friends and love. other feathered friends with company. Hi Pickles! Happy Pet of the Day to you, sweetheart! What a beautiful Quaker Parrot you are, Pickels, beautiful inside and out! Reading your humans' love filled tribute, seeing your utterly heart-melting photos, brought tears to my eyes! I'm so sorry to hear of your mommy and sister's health challenges; hopefully they're doing OK! One thing is for sure, their days are a whole lot brighter, their hearts so much lighter, with you in their lives! I smiled from ear to ear, learning of the happy home you share with your humans and assorted feathered friends, including the rescued, special needs chickens and your 2 parakeet pals! Ahh! Life is good! We are so thankful to your humans for rescuing your from a lifetime of breeding, providing you with the happy, carefree, love filled life you always deserved! And how well your humans' kindness has been rewarded, having a feathered family member, a best feathered friend as beautiful, as cheerful, as sweet and loving as you! You truly are a treasure, Pickles, one in a million, and so very deserving of your big day of honor! Thanks for the BIG smiles, Pickles! Meeting you today has been a joy! I hope you're enjoying a very special day of celebration....chatting with your humans and feathered friends and cuddling with your mom and sister, chowing down on tasty treats, being loved and pampered to pieces! Lots of love, cuddles and kisses to you, precious Pickles, our very special and most deserving Pet of the Day, EVERY day! Love to the dear chickens and parakeets, too! Dearest Pickles, you are utterly adorable! What a sweet, beautiful Quaker Parrot you are, and how lovely to see you cuddling up with your dear mom and sister! You bring great joy and strength to them as they contend with health issues. You have the most delightful personality. How nice that you have so many bird friends to hang out and chat with! We are so glad for and grateful to your dear people for the work they are doing with their chicken rescue, especially helping the special-needs chickens. Bless them and bless you all! You all love each other very much, don't you. What a wonderful love-filled home you share! 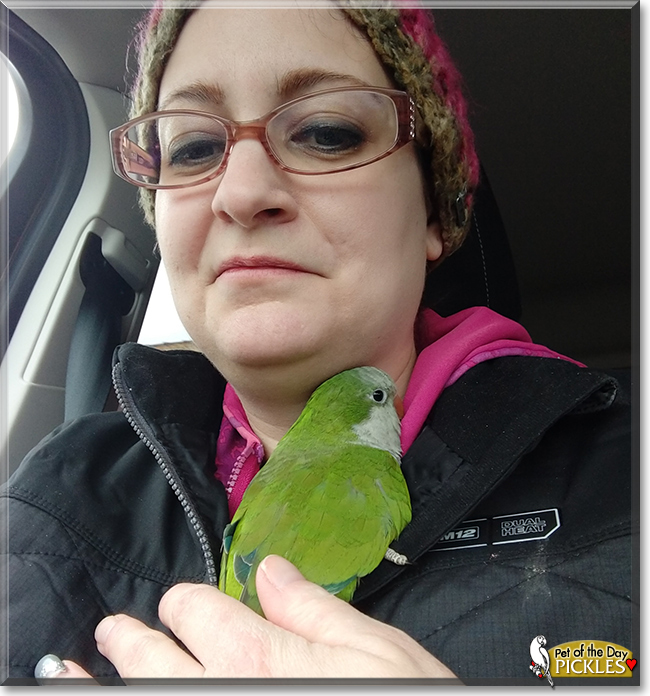 Congratulations, darling Pickles, on being chosen today's Pet of the Day! We hope you and your dear mom and sister and chicken housemates and all your family and friends are enjoying a fine celebration, full of fun and lovies and all your favorite games and treats. 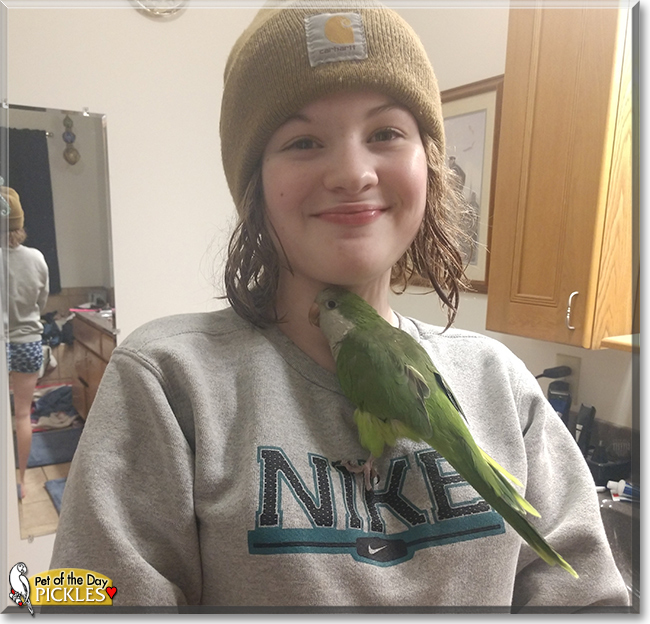 Congratulations, pretty Pickles, on being today's Pet of the Day!